If you work in a tall building, taking the elevator is inevitable. People take it for granted, which often makes it the site of the most common etiquette blunders you’ll ever encounter at work. Thou shalt not attempt to board elevator before previous passengers have disembarked. The universe does not revolve around you. Thou shalt not press button for wrong floor without acting appropriately ashamed as elevator stops and doors open then shut without anyone leaving. Thou shall hold the door for others running to catch the carriage. A plague on those who watch idly by as they slide shut in someone’s face. Thou shall wait for empty carriage if thou is sick. If that proves impossible, thou shall refrain from coughing/sneezing/etc. for duration of ride, even if this means thou’s face turns bright red and thou feels like dying. Thou shall give others their personal space in an uncrowded elevator. Thou shalt not call out their floor to the person standing nearest the buttons as if that person is the lift operator. If there is space to do so, thou shalt press button thyself. Thou shalt not carry on personal conversations, be they person-to-person or via cellular phone. Thine elevator is not thine phone booth. 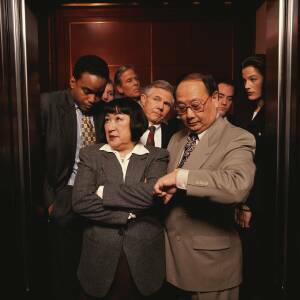 Treat the elevator as an extension of your workplace, and behave as if your most important client is with you. Then you won’t find yourself sucking on a popsicle and scratching your rear when the CEO steps on board. You think it might not happen to you, but Barbara* from Beverly Hills did not think it would happen to her, either. Let’s all learn from Barbara, and act our best in the office elevator.